This blog was originally posted a few weeks ago on Inspire a Fire. See the original at www.inspireafire.com/others-see/. Sometimes friends teach me things about myself I never knew. Maybe this isn’t exactly critical self-knowledge, but the point it raises certainly is. 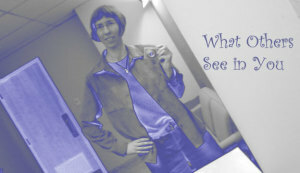 Sometimes others see something in me that I don’t see in myself. Sometimes these things are negative. I need friends to encourage me when I’m frustrated, to tell me to snap out of it when I’m defeated, to remind me to be thankful when I’m not. But just as importantly, I need friends to give me positive comments. I need to hear about the strengths I overlook, the skills I take for granted, the gifts I should be nurturing. I bet you’re the same. I bet you also need others to point out those things you overlook in yourself. And I bet your friends see more in you than you could possibly realize. God uses the people in our lives to help us find our way. But I’ll let you in on a secret. It’s not just our friends who see something more in us. There’s Someone besides my friends who knew I would talk with my hands. Because He created them. There’s Someone who knew I would eat sandwiches slowly and watermelon fast. Because He designed me that way. There is, as Solomon wrote, a friend who is closer even than a brother (Proverbs 18:24). Maybe Solomon was referring to our earthly friends, but his words are true of our ultimate Friend as well. 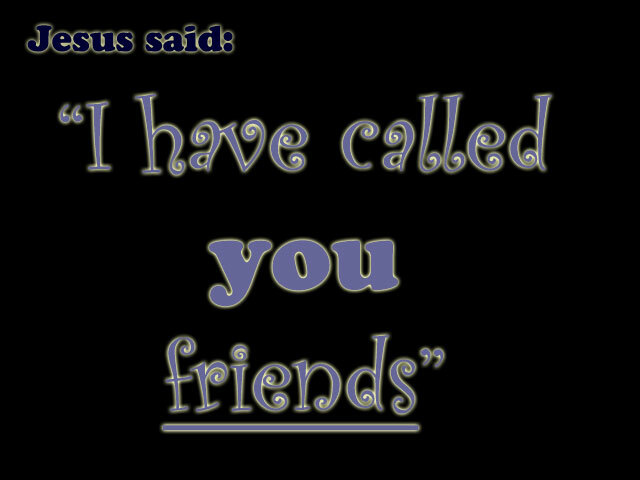 “I have called you friends,” Jesus said to his followers (John 15:15). You are loved and forgiven (John 3:16). You are handcrafted for a purpose (Ephesians 2:10). You are made in the very image of God (Genesis 1:27). You are called to perfection (Matthew 5:48). You are never alone (Matthew 28:20; Psalm 139:7-10). You are surrounded by God’s perfect peace (Isaiah 26:3). You are part of a family of believers dating back to the very first disciples (John 17:20-21). You are being guided, even in your moments of confusion (John 16:13; Proverbs 3:5-6). We don’t always know what happens next. If you’re like me, you have a hard enough time keeping up with what’s going on right now. But we can rest in the assurance that Someone else does know. And when we genuinely try to follow His direction, He will keep our feet on the right path. We are called, right now, to fulfill our days with the work that is at hand. Everything we need has been planted inside us. We just may need a little help bringing it out. Take the time to tell those around you what you see in them. Listen, to what others see in you. Most importantly, listen to the Friend who knows us even better than we can ever know ourselves. Sometimes friends teach us things about ourselves we never knew. Once upon a time I made the mistake of giving my dog a blackberry. Marly loves every kind of green (and other colored) plant. I first discovered this when she was just a puppy. She was begging in the kitchen while I was peeling an orange, and knowing that most dogs hate citrus, I decide this was a wonderful training opportunity. I tossed her a piece of orange, expecting her to grimace and step away. Instead, she snatched it up and begged for more. Ever since then, anytime that first whiff of citrus is released from a peeling orange, her four feet come skidding into the kitchen. That plan backfired. In addition to oranges, Marly loves grapefruit, bananas, green beans, potatoes, squash, carrots, apples, blueberries and – you guessed it – blackberries. She’s got that crazed blackberry picking look in her eyes! I wish you could have seen the look on her face the day she suddenly realized that this amazing delicacy was growing all alongside one of our favorite hiking trails. Her eyes sprung open in astonishment as she watched me pluck a berry from the bush and stick it in my mouth. 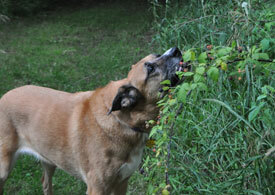 Next thing I knew, she had dived into the middle of the bushes and was stripping the berries directly into her mouth. Marly stripping blackberries from a bush. The only response was the shaking of first one bush and then another as she progressed deeper into the berry patch. Every summer now we have a ritual, walking along our favorite trail, both of us scoping out the slowly ripening berries. It’s a race to see which one of us can find the first ripened berry. I admit that sometimes I resort to diversion tactics. “Look over there!” I say, pointing to a small bush. 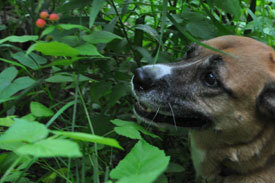 Then while she goes bounding one way, I run in the opposite direction, picking berries as quickly as I can. I feel I am justified in such tactics; she is a much faster picker than me, so I need all the help I can get. In peak season, there is always enough for both of us. We may even pick companionably from the same bush. She burrows underneath and gets all the deep and low berries; I pick high, only occasionally having to yell at her to stop shaking the bush because she’s making it hard to pick. 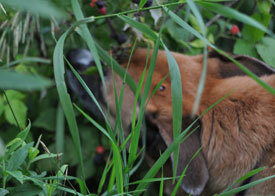 Marly is not afraid to burrow under a bush to get at the berries I can’t reach. 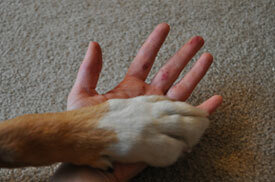 Blackberry season never lasts very long, but it’s a season I embrace with two hands and four paws. Like other good things in life, it is one of God’s good gifts to us. He did, after all, give us every green plant for food, and what a wonderful variety he provided! It is hard to believe that we are already staring down the slope toward the end of summer. With its long days and outdoor activities, summer always seems to go by quickly. But then, I often find myself saying that about every season. Are you having a busy summer? Take some time amidst all the action to simply enjoy the gift of sunshine and flowering plants that God has placed around us. Then, walk with Him into the next season. Partners in the berry patch. For everything there is a season, and a time for every matter under heaven (Ecclesiastes 3:1). I’m back again. Writing at the Citizen’s Band. I wasn’t going to let you know that. I was going to write about picking blackberries. But now that I’m here, I just can’t help it. Because something unexpected has happened. It’s about 90 degrees, even in the sinking sun. People are fanning themselves with the programs trying to stir an elusive breeze. The crowd is smaller, no doubt attributed to the (balmy) weather. But the thing that really caught my eye is – are you ready for this? – the swallows. Half a dozen swallows, maybe more, are performing circus stunts above the crowd. I don’t know that anyone else has even noticed them, but I can’t imagine how they couldn’t. They’re swooping through the air in Blue Angel precision, passing each other wing tip to wing tip before darting out of my sphere of vision. I’ve never thought of swallows as particularly impressive birds. Their pointy wings flutter like a bat’s. They fly in a stutter, and when they glide they don’t soar so much as struggle to stay afloat, tipping madly one way and then another. And yet seeing them up there tonight, darting above the band, has captivated me. I’d like to say something artistic, like how they flap their little wings in time to the music, but they don’t even do that. They are completely incongruous to the band. I don’t think they even notice the band. And what music tonight! It has a distinctly Latin flair. There are drums and a maraca, and after that I can’t name half the percussion instruments. One of them looks like a pair of wooden spoons that a burly fellow in the back is banging against his elbow. It produces a sound like angry crickets. There’s something about music, though, that makes you forget for a moment about the day, and about the heat. And there’s something about the swallows that is… what is it exactly? Friendly. As I’ve typed, the acrobatics have lessened. Perhaps they’ve headed home to bed. There is an occasional one or two, but in their absence the space above the band is suddenly a vacuous and deepening blue. Last week I hadn’t noticed the lack of them, but this week their absence suddenly becomes conspicuous. I am reminded of the passage that not one sparrow falls to ground unnoticed by God (Matthew 10:29). I imagine the same is true of a swallow. Every swallow who flutters home to bed is watched over by God. Even more than that, I am reminded of the very beginning, when out of a vacuous space, God created everything. The sun, the moon, the waters, and the earth. The creeping creatures, the roaring creatures, and the fluttering creatures. Even the darting little swallows. And God called it all good. I was taking my morning walk this morning as I usually do – with my eyes half shut. Someplace between leaving my front door and returning is where I typically wake up. This morning my point of waking up occurred when I was turning for home and noticed someone standing off the road taking a picture. I stopped to see what she was photographing. 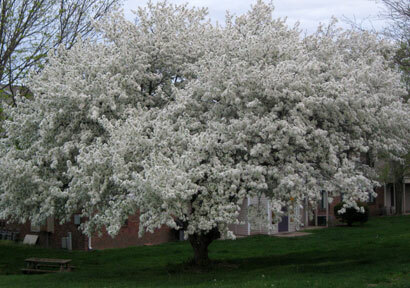 There was a beautiful tree in full blossom. This tree was so full of flowers, I don’t think there was room for even one more bloom. 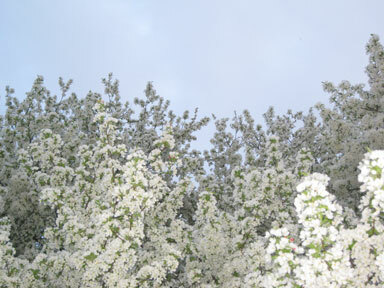 In the early morning light, the white blossoms practically glowed. So I went home and got my camera and took a picture, too. 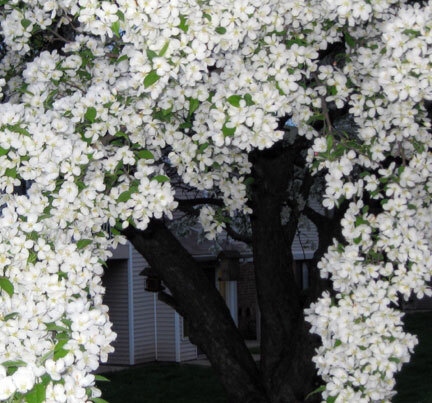 The tree in full bloom. Here was a piece of God’s beautiful creation that I almost walked right by. What other beauty did I miss this morning? What a shame it is to go through our days and never even see the beauty that is around us! Today, make it a point to keep your eyes open as you go about your usual routine. Be a witness to God’s creation. Stop and take a picture. Perhaps you will inspire someone else to do the same. At some point over the course of today I came to the realization that my shirt does not match the rest of my outfit. Unfortunately, this isn’t particularly surprising. It’s certainly not the first time, although I do actually make an effort to match… sometimes. The problem is I really don’t like anything about the whole “what should I wear today” scenario. For one thing, my selection is limited because I dislike shopping for clothes in the first place. For another, the clothes I would prefer to wear – garish colors in odd combinations – are typically frowned upon as not going together at all. It’s not that I’m trying to make a statement when I wear odd color combiantions. I just actually like purple, orange, and green. Together. Unfortunately, the rest of the world seems to disagree. So sometimes, even when I try to put together office attire that works, I suddenly realize, while standing beneath the fluorescent glow of the cubicle lights, that (oops) it really doesn’t. Pity the poor folks who work with me. I have a propensity for odd things. Colors, for starters. But also odd numbers. My favorite number is 27. And unlike some people who choose their favorite number because of a special personal significance, I chose my favorite number simply because it is odd. And not just odd itself, but composed entirely of another wonderfully odd number. In fact, 27 = 3 x 3 x 3. Three threes multiplied together! Really, what gets more perfectly odd than that? I have a theory that was developed over the course of late night conversations with friends who occasionally humor me in pondering ridiculously inconsequential subjects during the wee hours of the morning. My theory goes like this: I was born in an odd month. On an odd day. In an odd year. It is another perfect set of three odd numbers. Clearly, I am destined for oddity. It turns out, the Bible supports me in this. Maybe not so much the odd birthday theory, but God does uniquely create each one of us to fulfill the special destiny He has ordained. To Jeremiah, God declared: Before I formed you in the womb I knew you, before you were born I set you apart; I appointed you as a prophet to the nations. (Jeremiah 1:5). David acknowledges, “For you created my inmost being; you knit me together in my mother’s womb…I am fearfully and wonderfully made. (Psalm 139:13-14). Paul, too, writes frequently of the unique contributions expected of believers. Just as each of us has one body with many members, and these members do not all have the same function, so in Christ we who are many form one body, and each member belongs to all the others. We have different gifts, according to the grace given us (Romans 12:4-6). I am odd. But more than odd, I’m one-of-a-kind. I have a special place within God’s plan. He made every detail of me especially for His purposes, and that includes my preference for numbers and colors. He made every detail of you especially for his purposes, too. Have you ever felt like the odd man out? That’s probably because you are. But then, so is everyone else. We are all fearfully and wonderfully made. And we were all made with God’s good purpose in mind. We must take our place within the body of Christ, because we are the only ones who can fulfill the plan that God created us for. There is no one else who can do it. God has created each one of us unique. In God’s eyes, every one of us is matchless. I praise you because I am fearfully and wonderfully made; your works are wonderful, I know that full well (Psalm 139:14).